This project was a dream collaboration! Pete is a huge music buff, with a kaleidoscopic and ever-growing collection of albums on CDs (we often joke that Pete is single handedly keeping CDs in circulation). Suffice it to say, Pete was over the moon when Bear Creek Recording Studio—graced by artists ranging from the Lumineers to Lionel Richie—got in touch, asking for a a sensational treetop studio. 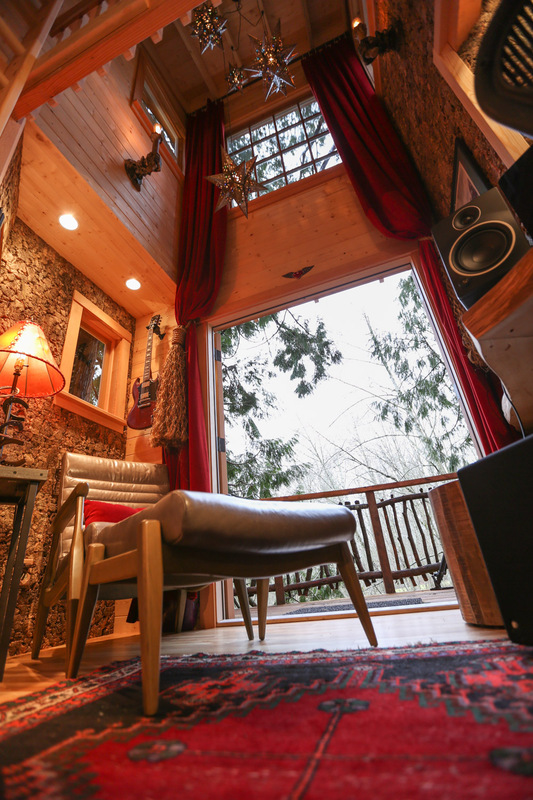 Nestled 20 feet high in six western red cedars, this treehouse recording studio exudes creative vibes. Lots of warm-toned wood, rustic cork paneling, vaulted ceilings, and an ample deck bring artists in touch with nature in an ultra-cozy and elegant space. With its mixing station, recording nook, lounge, bathroom with a composting toilet, and ladder to a sleeping loft, this treehouse is the perfect retreat for making magical music. The crew wrapped the exterior in cedar board and batten and sheets of weathered corten steel. Access to the front door is via a wooden ramp and staircase bordered by natural branch railing pickets. Pete and the crew crafted these pickets from the fallen branches of the cedars hosting the treehouse. It's a beautiful way of connecting the treehouse to its surroundings! The first floor holds a music mixing station, tons of comfy seating, and a recording nook. The crew paneled these walls with one-inch thick cork tiles from Cali Bamboo. This natural material soaks up sound, making it perfect for the recording studio. Plus, it mimics the look of tree bark! Toby, one of our intrepid Project Managers, crafted this gorgeous live-edge slab desk for the mixing station. The natural materials, custom details, and warm lighting make the space feel inviting and serene. The double doors to the deck open the studio to nature. From the curved deck, artists can soak in sweeping views of the surrounding Pacific Northwest forest. Back inside, artists can ascend the ladder to the loft. What's a recording studio without a spot for creative breaks? Artists can stop for a snooze in this cozy bedroom loft. 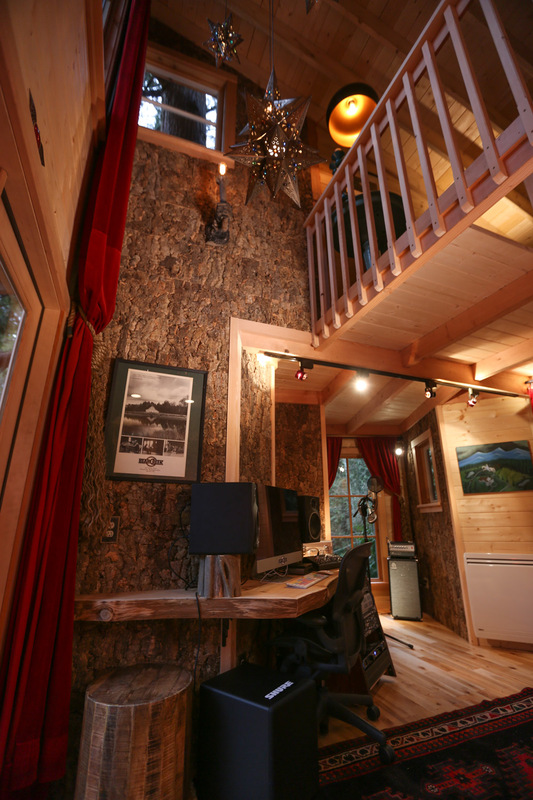 We hope you've enjoyed taking a look inside our treetop recording studio! We wish all the artists who visit many moments of magical music-making up in the trees. 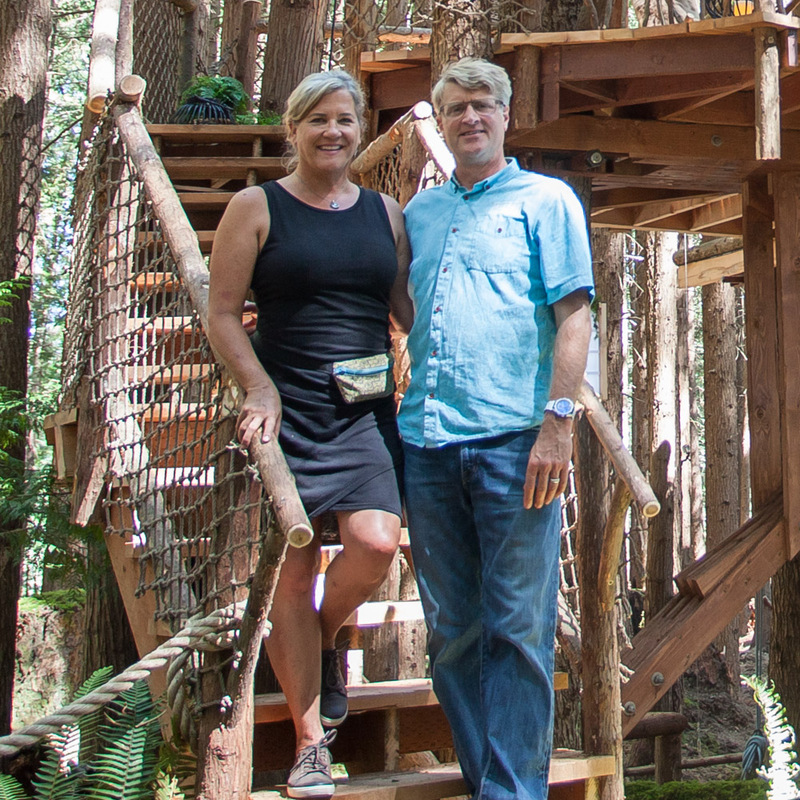 You can see more treehouse tours here.